Lawrence University pianist Elizabeth Vaughan earned first-place honors Saturday, Oct. 15 in the 2013 Music Teachers National Association (MTNA) Wisconsin state competition conducted at UW-La Crosse. Vaughan, a junior voice and piano performance major from Highland Park, Ill., won the Young Artist (19-26 years of age) competition. She advances to the MTNA’s five-state East Central Division competition Jan. 10-11 at Baldwin Wallace University. Winners at the division competition advance to the MTNA’s national competition March 22-26, 2014 in Chicago. Vaughan is the 13th Lawrence student in the past 15 years to win the Wisconsin MTNA piano competition. She is a student in the studio of Professor Catherine Kautsky. Lawrence pianists dominated the competition, which featured a total of 12 students. Besides Vaughan’s first-place finish, senior Thomas Lee, Chicago, Ill., earned alternate (second place) honors while seniors Max Feldkamp, Appleton, Jonathan Gmeinder, Hartland, Daniel Kuzuhara, Madison, and junior Laetitia Lehman-Pearsall, Bainbridge Island, Wash., each were accorded honorable mention honors. Gmeinder and Laetitia also study in Kautsky’s studio. Lee, Feldkamp and Kuzuhara are students of Associate Professor Anthony Padilla. An artist-in-residency by award-winning Puerto Rican-born composer Roberto Sierra and the Arcos Trio highlight a week-long celebration of Latin American music, art and culture Nov. 4-12 at Lawrence University. All festival events are free and open to the public. The Latin American Chamber Music Festival will feature more than a half dozen performances by the Arcos Trio during the week, including the world premiere performance of Sierra’s piano trio composition “Trio IV ‘La noche’” Thursday, Nov. 10 in Harper Hall of the Music-Drama Center. Sierra will discuss his works in the context of Latin American music in a pre-concert address at 6:30 p.m. The concert also will feature works by Brazilian composer Oscar Lorenzo Fernandez, Uruguayan composer Miguel del Aguila and arrangements of the popular tangos by Argentinian composer Astor Piazzolla. A reception with Latin American cuisine provided by Appleton restaurant Antojitos Mexicanos follows the concert. Sierra’s works have been part of the repertoire of many of the leading orchestras, ensembles and festivals in the United States and Europe for more than 30 years. His “Fandangos” was performed at the inaugural concert of the 2002 world renowned Proms in London by the BBC Symphony Orchestra in a concert that was broadcast by both the BBC Radio and Television throughout the United Kingdom and Europe. His music has been performed by many of the leading orchestras in the country as well as the Royal Scottish National Orchestra, the Tonhalle Orchestra of Zurich, the Spanish orchestras of Madrid, Galicia, Castilla y León and Barcelona, among others. In addition to performing the premiere of “Trio IV ‘La noche’” the Arcos Trio will conduct a master class and perform several “preview” concerts in the community. 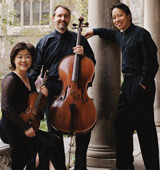 Arcos Trio — pianist Padilla, violinist Seunghee Lee and cellist Carl Donakowski — was formed in 2005 with a mission to present an expanded canon of standard piano trio repertoire. The Latin American Chamber Music Festival is the trio’s current project and will be reprized with performances in Michigan and Virginia. • Friday Nov. 4 — Steinway and a Sandwich Series: Arcos Trio preview performance: Heid Music, Appleton, 12 noon. • Saturday, Sunday Nov. 5-6 — Arcos Trio preview performances, St. Therese and St. Pius X Catholic Churches weekend masses, Appleton. • Monday–Friday, Nov. 7–11 —Mexican print collection display: Quirk Print Study Room, Wriston Art Center Galleries, 8 a.m. – 4 p.m. Digital reproductions of this collection will be shown in Harper Hall lobby, Music-Drama Center. • Monday Nov. 7 — Arcos Trio community outreach preview performances: Appleton East High School, 8:45 a.m. and 9:40 a.m.
• Tuesday, Nov. 8 — Arcos Trio community outreach preview performance: Appleton Classical School, 12:50 p.m.
• Tuesday, Nov. 8 — Master Class: Arcos Trio, Harper Hall, Music-Drama Center, 4:30 p.m.
• Wednesday, Nov. 9 — Preview Performance: Arcos Trio and Lawrence Conservatory students play works by Latin American composers, Harmony Café, downtown Appleton, 7 p.m.
• Thursday, Nov. 10 —Pre-concert lecture: Guest composer Roberto Sierra discusses his works in the context of Latin American music, Harper Hall, Music-Drama Center, 7 p.m.
• Thursday, Nov. 10 —Arcos Trio Concert: Premiere performance of “Trio No. 4 ‘La noche’” (2011), by Roberto Sierra, Harper Hall, Music-Drama Center, 8 p.m. Reception with Latin American cuisine from Antojitos Mexicanos follows. • Friday, Nov. 11 —Question-and-answer session with guest composer Roberto Sierra, Harper Hall, Music-Drama Center, 4:30–5:30 p.m.
• Saturday, Nov. 12 — Spanish department and Latin American studies program presentations: Gustavo Fares, professor of Spanish, “Tango! And nation building”; Jake Frederick, assistant professor of history, “The ‘New World’ of Latin America”; and Javier Guerrero, postdoctoral fellow in Spanish, “Sangrita Mexicana: Blood Weddings in Contemporary Mexico,” Harper Hall, Music-Drama Center, 1 p.m. A reception with Latin American cuisine from Antojitos Mexicanos follows. • Saturday, Nov. 12 —Student recitals: Lawrence students perform works by Latin American composers, Harper Hall, Music-Drama Center, 3 p.m. The Latin American Chamber Music Festival received collaborative financial support from the National Endowment for the Arts, the Fox Valley Community Arts Fund within the Community Foundation for the Fox Valley Region, and the Wisconsin Arts Board with funds from the State of Wisconsin.